Prof. G. L. Peiris, Minister of Export Development and International Trade visited New York and Washington DC last week to encourage United Nations and U.S. government support for the post-conflict economic projects and foreign investment. Prof. Peris met with Susan Rice, U.S. Ambassador to the United Nations, as well as an Assistant U.S. Trade Representative and the Acting Under Secretary of the Department of Commerce. uring two busy days of meetings, Minister Peiris also consulted with Rep. Sander Levin, (D-Michigan), who is Chairman of the Trade Subcommittee of the influential House of Representatives Ways and Means Committee. 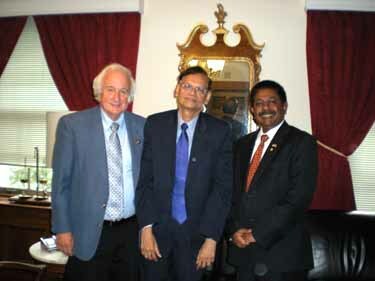 Rep. Levin said that Sri Lanka would be considered during his subcommittee’s examination of future trade agreements. Minister Peiris told Congressman Levin and other U.S. government officials that now was the time for renewed investment in Sri Lanka, as the country resettles those displaced by the 25-year-long conflict, rebuilds the north and launches a political process that will give the Tamil population a new voice. The World Bank earlier in the week approved a $24 million, 20-year loan to bolster Sri Lankan Healthcare efforts, especially in the Eastern and Northern Provinces, both areas that have been affected by the recent conflict and victory over the Liberation Tigers of Tamil Eelam. The U.S. State Department also announced an additional $6 million in aid to help pay for de-mining operations in Northern Sri Lanka. Asian investors and companies, Minister Peiris said, have been quick to show interest in Sri Lanka since the conflict’s end. While interests from Malaysia are the most active, Japan and China are also currently involved in projects throughout Sri Lanka. The government expects growth in traditional sectors, such as tourism, tea and rubber production and the garment industry, as well as an expansion of agricultural production and construction when the post-conflict development takes hold.